The following report was released on May 2, 2013 by the Department of Defense. The Democratic People’s Republic of Korea (DPRK) remains one of the United States’ most critical security challenges in Northeast Asia. North Korea remains a security threat because of its willingness to undertake provocative and destabilizing behavior, including attacks on the Republic of Korea (ROK), its pursuit of nuclear weapons and long-range ballistic missiles, and its willingness to proliferate weapons in contravention of its international agreements and United Nations Security Council Resolutions. North Korean aspiration for reunification – attainable in its mind in part by expelling U.S. forces from the Peninsula – and its commitment to perpetuating the Kim family regime are largely unchanged since the nation’s founding in 1948, but its strategies to achieve these goals have evolved significantly. Under Kim Jong Il, DPRK strategy had been focused on internal security; coercive diplomacy to compel acceptance of its diplomatic, economic and security interests; development of strategic military capabilities to deter external attack; and challenging the ROK and the U.S.-ROK Alliance. We anticipate these strategic goals will be consistent under North Korea’s new leader, Kim Jong Un. North Korea fields a large, forward-deployed military that retains the capability to inflict serious damage on the ROK, despite significant resource shortfalls and aging hardware. The DPRK continues to be deterred from conducting attacks on the ROK largely because of the strength of the U.S.-ROK Alliance. On a smaller scale, however, the DPRK has demonstrated its willingness to use military provocation to achieve national goals, such as in 2010 when it sank the ROK naval vessel CHEONAN, killing 46 ROK Navy sailors, and shelled Yeonpyeong Island, killing two ROK Marines and two civilians. 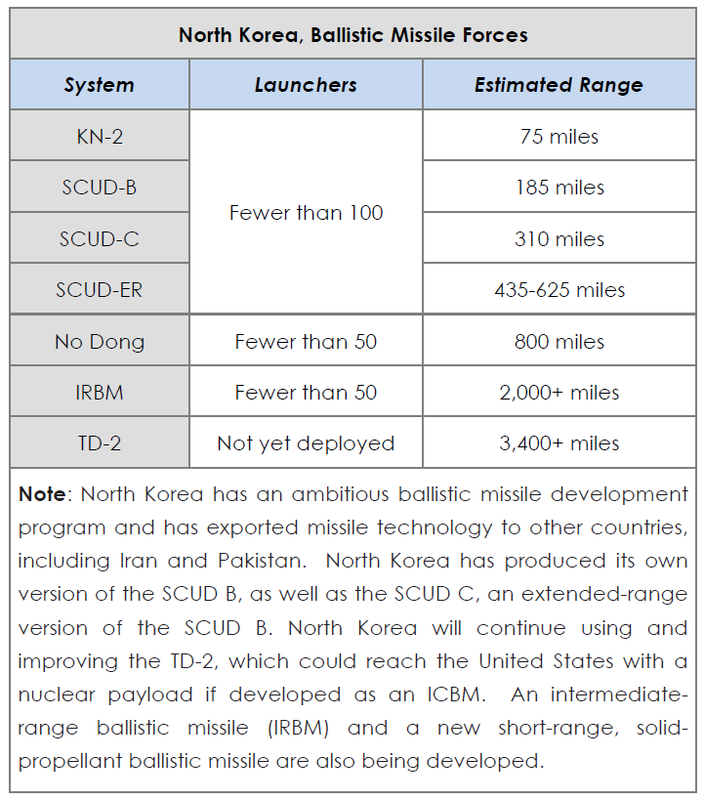 North Korea’s continued pursuit of nuclear technology and capabilities and development of long-range ballistic missile programs, as reflected in the December 2012 Taepo Dong 2 missile launch and April 2012 display of a new road-mobile intercontinental ballistic missile, underscores the threat to regional stability and U.S. national security posed by North Korea. 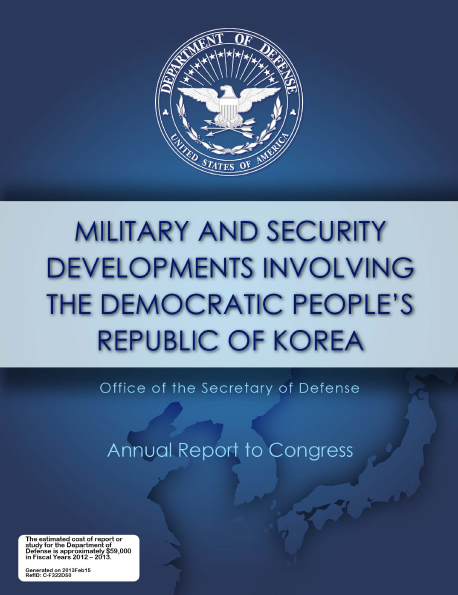 These programs, as well as North Korea’s expressed hostility toward the ROK and proliferation of items prohibited under United Nations Security Council Resolutions 1718, 1874, and 2087 make the DPRK a continued security challenge for the United States and its Allies and partners. North Korea’s third nuclear test in February 2013 and its 2010 revelation of a uranium enrichment facility highlight the continued challenge posed by North Korea’s nuclear programs. Both the September 19 Joint Statement of the Six Party Talks and United Nations Security Council Resolutions 1718, 1874, and 2087 call for the complete and verifiable denuclearization of North Korea. Given North Korea’s unwillingness to abide by these commitments, the Department of Defense will continue to manage the North Korean security challenge through close coordination and consultation with the international community, particularly with our ROK and Japanese Allies. The United States remains vigilant in the face of North Korea’s continued provocations and steadfast in commitments to Allies in the region, including the security provided by extended deterrence commitments through both the nuclear umbrella and conventional forces. The Democratic People’s Republic of Korea (DPRK or North Korea) has stated that it is entering what it calls “the door in a strong and prosperous nation” in 2012. The transfer of power to Kim Jong Un, after the death of Kim Jong Il in December 2011, has shaped the internal political landscape of North Korea and its international relations. In April 2012, Kim Jong Un assumed top-level positions in the Korean Worker’s Party (KWP) and the National Defense Commission, formalizing his role as the North’s top leader. Yet North Korea continues to fall behind the rising national power of its regional neighbors, creating a widening military disparity and fueling its commitment to improving asymmetric and strategic deterrent capabilities as the primary guarantor of regime survival. Tensions on the Korean Peninsula have grown as relations between the DPRK and the Republic of Korea (ROK) worsened through 2011 and remained uneasy through mid-2012. The DPRK’s frustration with the ROK’s close policy coordination with the United States and its linkage of assistance to the North to progress in denuclearization grew over the past five years of President Lee Myung-bak, and is unlikely to change significantly under the tenure of President Park Geun-hye. North Korean threat perceptions are shaped by a legacy of guerilla warfare dating back to its anti–colonial struggle against the Japanese, political and economic isolation, experience during wartime, and a political culture that is defined by an unending existential struggle with outside forces. North Korea has portrayed the ROK and the United States as constant threats to North Korea’s sovereignty, in a probable attempt to legitimize and justify the Kim family rule, its draconian internal control mechanisms, and its existing strategies as the best defense against encroachments on the North’s sovereignty. The regime’s greatest security concern is opposition from within, and outside forces – primarily South Korea – taking advantage of internal instability to topple the regime and achieve unification of the Korean Peninsula. In North Korea’s view, the destruction of regimes such as Ceausescu, Hussain, and Qadhafi was not an inevitable consequence of repressive governments, but rather a failure to secure the necessary capabilities to defend their respective autocratic regime’s survival.